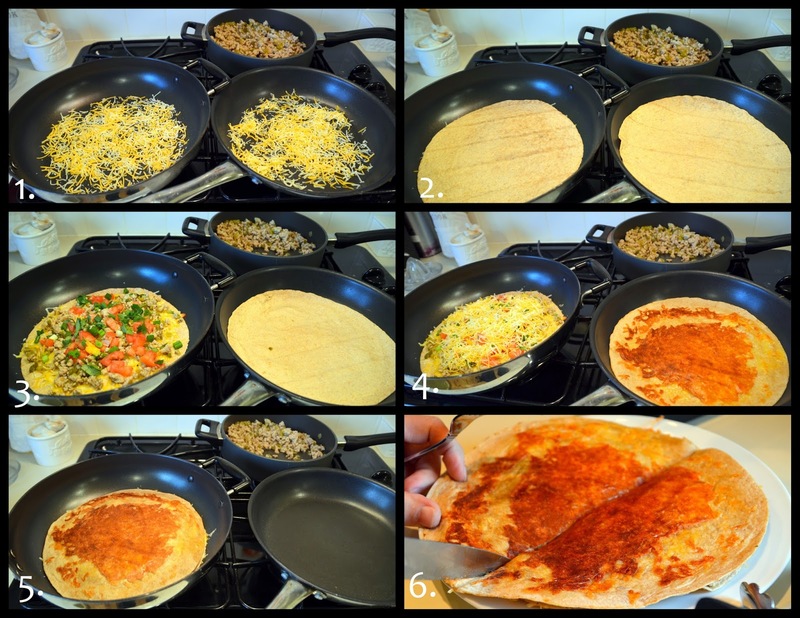 For Flashback Friday I'm re-visiting my chicken quesadillas and giving them a new twist. This is a great quick meal when you have a few key ingredients on hand. Saute onion in heated vegetable oil until translucent. Add the ground chicken, chiles, and seasonings. With a spatula turner shift the tortilla a little in the pan making sure the cheese is sticking to the bottom of the tortilla. Top with some avocado, sour cream and salsa and enjoy. We had a Southwest salad to go along side, too. The melted cheese in the pan that adheres to the tortillas gives the tortillas a nice crispy layer of goodness. Oh my gosh Ellen, that looks so appetizing! What a great meal! I am hankering for quesadillas now! were would this mexican market be? my goodness, that looks tasty! Thanks for stopping by and your sweet words of encouragement. I have always loved reading cook books and your blog is like having my very on book. I'm drooling all over the keyboard! Oh my goodness, that looks delicious! What a great idea of putting extra cheese in the skillet before you put the first tortilla in. Yum!Yum! I like quesadillas and even better with that extra cheese which makes them even more crispy..thanks for that tip Ellen! Your quesadillas look most delicious! And to have fresh guacamole & salsa available daily at a Mexican market...how handy is that? Yum! awesome blog. Thanks for visiting mine! I enjoy any feedback as I am new to the blog world. Wow! Those look fantastic! We had quesadillas last night, but I think yours, with the carmelized veggies, probably win hands down! And a cool tip on putting some cheese in the pan first. Ellen, your quesadilla's look so yummy. I love making this kind of food for a quick dinner. ..
Must try this.LOVE carmelized onion! Gotta tell you: saw your dear image of Mrs. Tiggywinkle and had to laugh. I "found" her at age 13 and became a fan. As I browsed your blogger profile I smiled - loved so much that is there. You must be a great one to know. Those the yummiest looking quesadillas I've ever seen! What a great trick to melt the cheese in the pan. Happy weekend to you! Your photos are making me feel hungry! Thank you for sharing as it's always good to try a new recipe such as this one. I think this sounds, and looks, really tasty but I don't know whether my hubby would eat it. I might just try it as a surprise.